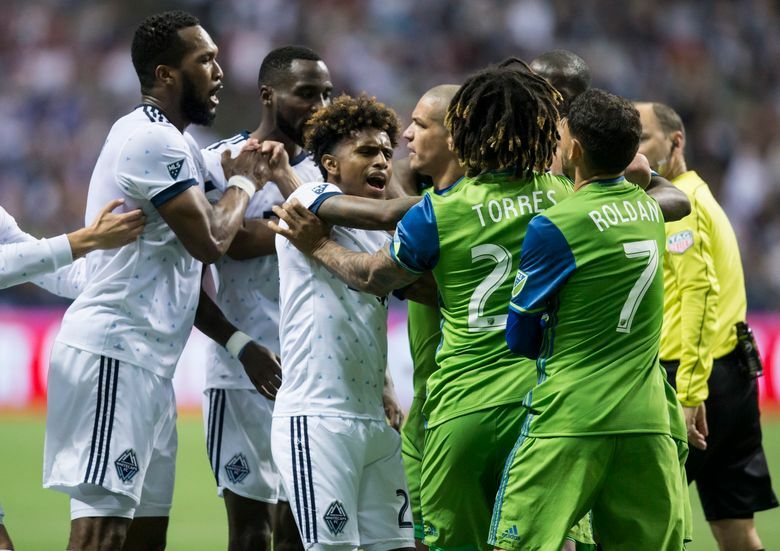 The Sounders have an even longer Cascadia rivalry with the Vancouver Whitecaps than they do with Portland, even though it doesn't always evoke the passion. Still, these teams have had an interesting past 10 months and will have plenty at stake Saturday at B.C. Place Stadium. It’s the four-decades-plus Cascadia rivalry everybody seems prone to overlook, no matter how many times the Seattle Sounders and Vancouver Whitecaps keep giving them reason not to. Compared to how the Portland Timbers stir our city’s soccer passions – even in down years — for that derby, the Whitecaps and Sounders lately seem to trail even Canada-U.S. trade negotiations on the mutual annoyance scale. Which is strange, given the Whitecaps just played the Sounders in the playoffs last fall while the Timbers haven’t done that in five years. It wasn’t a quiet conference semifinal either, with the teams nearly brawling in the opener while B.C. Place Stadium security guards ejected leaders of the Emerald City Supporters group for brandishing antifascist signs. The Sounders beat up on an undermanned Vancouver side to start what’s become a Major League Soccer-record eight-game winning streak. But the Whitecaps, with star midfielder Alphonso Davies back in the fold, haven’t lost since and will seek to spoil the Sounders’ bid for their first Cascadia Cup since 2015 Saturday and keep their own playoff hopes alive. So, the last 10 months alone should more than have stoked some flames that longtime Sounders coach and former player Brian Schmetzer insists are there even if it’s not always as obvious as the Portland dislike. Schmetzer recalled coaching a preseason United Soccer League game against Vancouver, when Sounders legend Zach Scott took out an opponent – “just kills the guy’’ — right from the opening whistle to earn a straight red card and spark a brawl. Indeed, born in 1974, the rivalry with the Whitecaps predates the Timbers series by a year. And it’s not like, given the Western Conference standings, either team needs motivating ahead of the match. The Whitecaps are unbeaten in six games, going 4-0-2, since the Sounders defeated them 2-0 on July 21 at CenturyLink Field. Teenage phenom Davies was pulled from that match ahead of the Whitecaps agreeing to a transfer deal with Bayern Munich worth up to $22 million. The deal calls for Davies, 17, born in Ghana but raised in Canada since age 5, to join the German side next January. Having become the youngest player in MLS history in 2016, he’s in his third season already and has six goals and a team-high 10 assists. Vancouver sits seventh in the standings, just a point behind the Sounders for the sixth and final playoff spot. But the Sounders also hold a game in hand on the Whitecaps and several other conference teams and are looking to climb up the standings their final eight matches. Not to mention, they can capture their fifth Cascadia Cup, emblematic of Pacific Northwest soccer supremacy. The trophy has existed since 2004 and was won by the USL Sounders in 2006 and 2007 and the MLS version in 2011 and 2015 – the last of those clinched at B.C. Place. Alonso doesn’t feel the Sounders need to alter much facing the dangerous Davies. They’ve blanked the Whitecaps their last four meetings and have succeeded in their record win streak largely by staying as aggressive on the road as they have at home. Sounders forward Will Bruin welcomes the challenge of winning a Cascadia Cup away from home. “It’s bragging rights at the end of the day, and I think anytime we have a chance to win any kind of trophy, it’s something we take pride in,” Bruin said. “It would be great to clinch that on the road at Vancouver.